Responding to anti-dairy sentiment, NZ Farmer editor Jon Morgan recently suggested the industry is still basically a collection of family farms "and their stories are the strongest asset a PR campaign has". He suggested using social media, farm open days and other events to tell the wider population about the technology farmers use, the stream banks planted, how cows are kept away from sensitive areas ... An open day on their farm is what Feds regional policy adviser Kristy McGregor and her family tried late last year - with rewarding results. 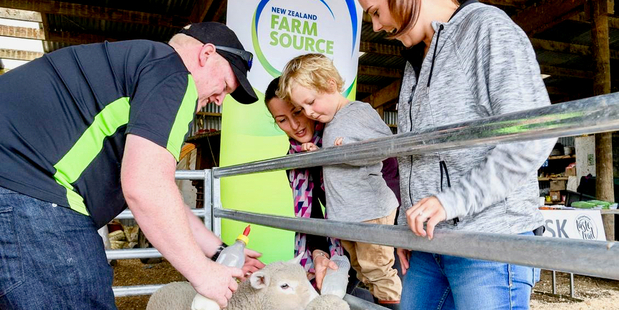 Last November, 10 Horowhenua growers and producers opened their gates to the public. Many of these had never opened up their business, and their homes, before. We were a little nervous, and unsure how many town folk would want to don their gumboots and trek through the mud for the inaugural Horowhenua Taste Trail on what turned out to be a wet and rather miserable spring day. I asked my father-in-law how many people he was expecting on what was the first time the 600 acre dairy and beef farm had thrown open the gates. He said we'd be lucky if we got 100 people - on a good day. We put hay bales in the implements shed, and a few baby lambs on display (much to the delight of the children at bottle feeding time). Our Fonterra area manager was there with Mainland cheese tastings at the ready, and to answer questions. Outside, the Little Black Caravan, a local coffee and drinks van, was set up, serving Whittakers Iced Chocolate made with organic milk donated from Fonterra's Mako Mako factory. From no later than a minute past 10am, cars started streaming up the tanker track. As people arrived, the cow bell was rung and people were drawn to the tractor. Taking turns, father and son shared with the visitors the history of the farm. How it had been in the family for five generations. How it started as a sheep property, and had its time as a deer farm, before being converted to dairy. The next stop on the farm tour was the vat, where it was explained how the milk is kept cool, and how often the collection tanker comes. At the cow shed my partner had selected eight of his most prized - and quietest - 'girls' to be on show. They had to be patient because over the course of the day they were moved in and out of the shed to a small holding paddock five times! Each tour there was a cow to be milked, and the process was explained. One mother told me she had brought her children along when earlier in the week she realised her daughter had no idea where milk came from. Kids and adults asked questions, knowing they would get a genuine response from the farmer before them. From the cow shed the tour moved down the race, past the old woolshed to the calf shed, and on to the effluent pond. Why the effluent pond? One could only hope the wind was not blowing the wrong way. But it was a deliberate decision to show the investment that goes into farm infrastructure and managing nutrients. Along the walk, visitors could view the coastal dune lake that forms the centrepiece of the farm, and is treasured for its place as a spot for recreation over many summers. Father and son spoke of their work to protect the native vegetation remnants, and recently working with the regional council on conservation plantings to better enhance the lake environment. Visitors were overwhelmed by the beauty of this little bit of paradise we were hiding. It sometimes takes new eyes to appreciate what you've got too; I looked around and realised we were indeed quite blessed, even if it was overcast and grey. And we were met with gratefulness from the visitors. One Taste Trail attendee told us she was pleased there was no security present. I have interpreted this to mean that people were thankful for the trust we showed in them, unspoken, as we offered our farm and said, 'welcome, come and take a look around'. More than 430 people came down our tanker track that day. A resounding success if you consider that all my father-in-law was expecting was 100 people only on a sunny day. The Keeling family and their pride in Takapu Farm is the same as most other farmers and producers. We all love what we do and would love the opportunity to share it. - Kristy McGregor co-founded the Horowhenua Taste Trail in conjunction with local growers to help the community better connect with their local producers. Based on the success of the inaugural event, there are plans to grow the Taste Trail concept in 2017.